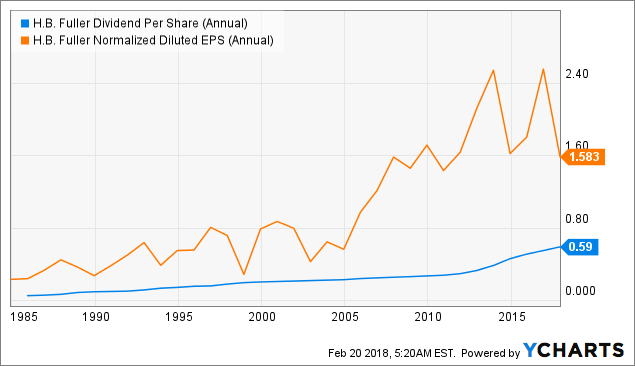 In this article, I am trying to research cheap dividend growth stocks with a very long history of dividend hikes. 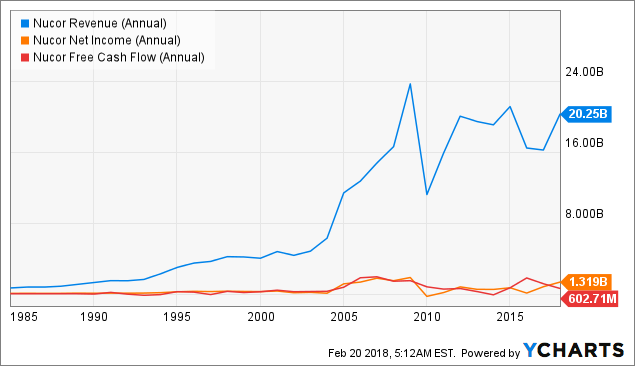 I’m a big fan of cheap dividend growth stocks. I deeply believe that those assets could give investors a solid return with a safety blanket. For sure, there are not many stocks on the screen, only six. The massive stock market rally pushed asset prices and stock valuations to above normal levels. The good thing is, if you look steady for stock opportunities, you will ever find some. 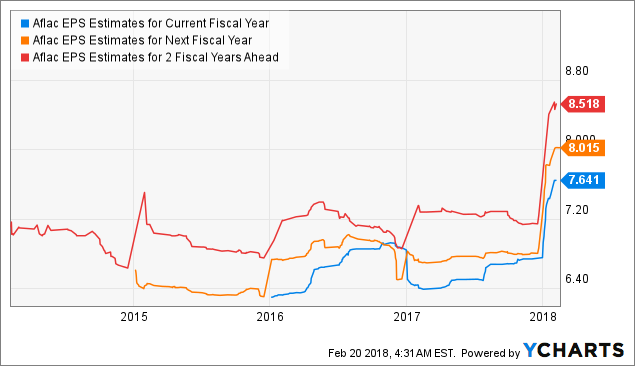 The current screen generated three financial stocks of which two come from the asset management industry and one from the life insurance industry: T. Rowe Price (NASDAQ:TROW) and Eaton Vance Corp. (NYSE:EV) are the two asset managers and Aflac (NYSE:AFL) the life insurer. In addition, two basic material stocks are on the list, Nucor Corp. (NYSE: NUE) and H.B. Fuller (NYSE:FUL). Finally, the drug retailer Walgreens is also part of the screen due to high growth and low forward P/E multiples. Now let’s have a closer look at each stock. T. Rowe Price Group is a financial services holding company, which engages in the provision of investment advisory services. It provides an array of company sponsored U.S. mutual funds, other sponsored pooled investment vehicles, subadvisory services, separate account management, recordkeeping, and related services to individuals, advisors, institutions, financial intermediaries, and retirement plan sponsors. Nearly 87% of TROW's sales are related to the Investment Advisory Business. Sales of T. Rowe amounted to USD 4.8 billion in 2017 while net income reached a value of USD 1.5 billion. 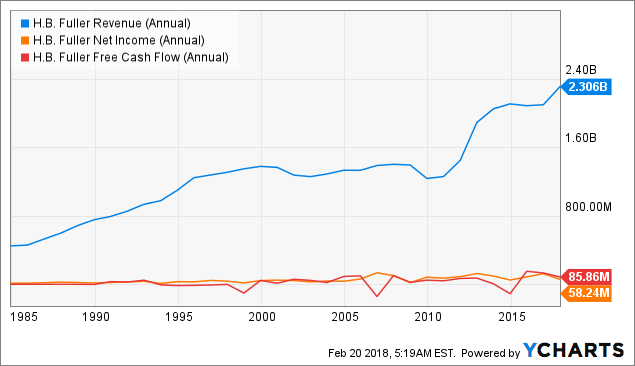 T. Rowe Price is a good and well known Dividend Champion. The company managed to raise dividends over 32 consecutive years. The 10-year dividend growth rate amounted to 12.9%. That's a good number. Last week, TROW announced to hike its dividend by 23% to USD 70 cents per share; a massive hike that affirms the good running business. 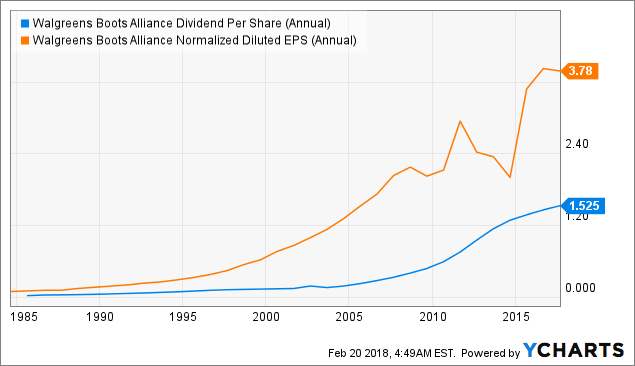 T. Rowe has a significant gap between earnings and dividend payments. 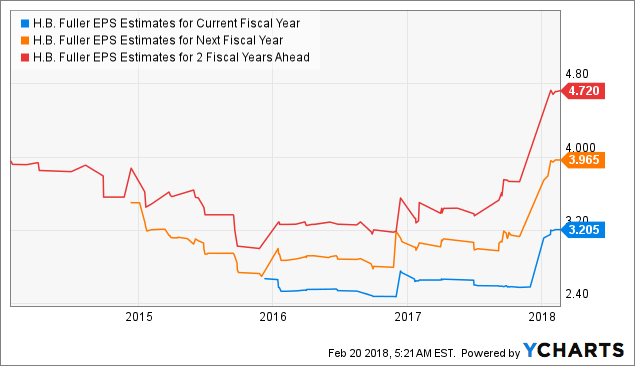 This gives investors room to speculate on further rising dividends, especially when you look at the free cash flow situation, debt situation and growth forecasts. 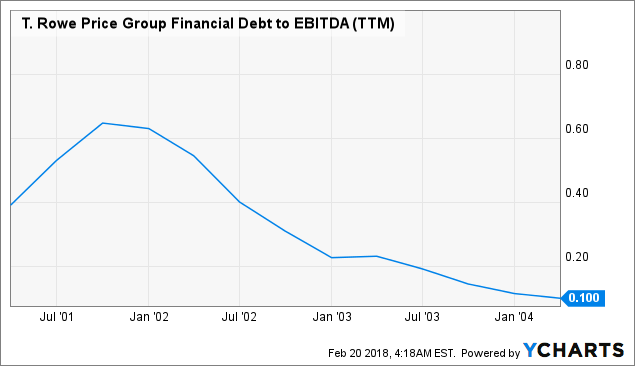 The asset management industry facing pressure from passive managed fund operators like Blackrock (NYSE:BLK) who reported more and more incoming assets. There is a clear shift from active managed to passive managed. Despite the headwinds, TROW could announce a record amount of assets under management of USD 1.05 trillion as of January 2018. The reason for this development could be the good financial market who climbed from record to record in recent years. 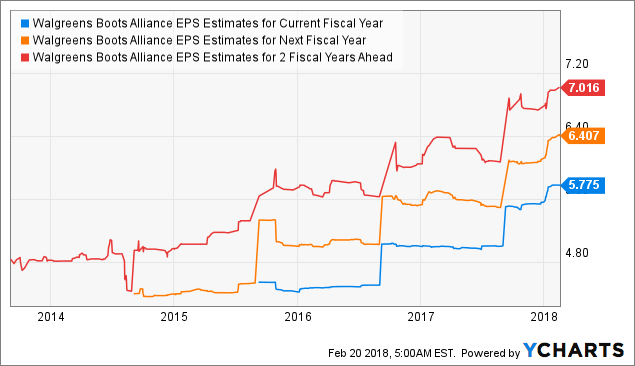 However, analysts ramped up its EPS revisions for 2018. Now they expect EPS at USD 7.11 for 2018 and USD 7.51 for 2019. The Aflac Company operates through the Aflac Japan and Aflac United States segments. The Aflac Japan segment offers life insurance, death benefits, and cash surrender values. The Aflac U.S. segment sells voluntary supplemental insurance products for people who already have major medical or primary insurance coverage. Sales of Aflac amounted to USD 21.67 billion while net income reached a value of USD 4.4 billion. The free cash is significant higher than the annual income. The past performance of AFL looks good but the insurer faces headwinds since 2012. There may be two reasons: Shrinking Japanese population and low interest rates. Aflac is one of my top picks if you like to put money in this area. Aflac increased dividends over 36 consecutive years. The long-term dividend growth rate (10-year average) stood at 8.1%. 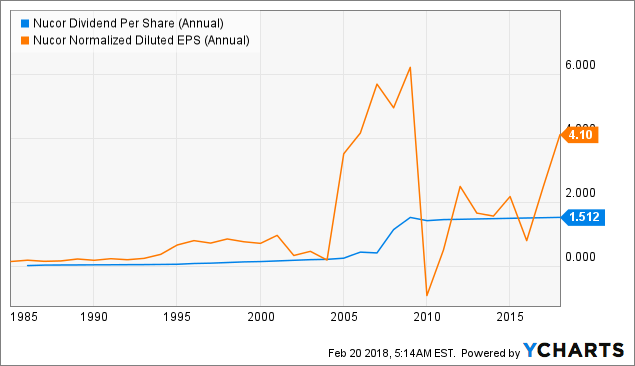 The latest dividend hike of 15.5% is much higher than the past value. This indicates a gaining momentum for the stock. Most of Aflac's sales come from its Japan health and life insurance businesses. The company depends heavily on the Japanese economy and therefore on the foreign insurance industry. But it owns a deeply integrated business and works in a conservative industry with a strong brand. With rising interest rates, it could be easier for the insurer to generate more returns on its pension products. However, earnings are estimated at USD 7.6 for 2018 and USD 8.0 for 2019. 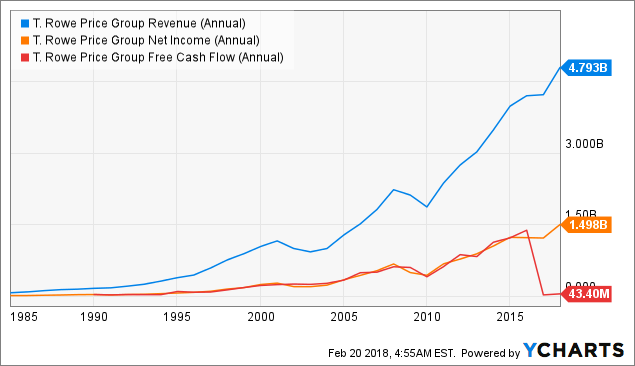 There is still room to grow dividends if you look at the free cash flow and the gap between earnings and paid dividends. Walgreens Boots Alliance engages in providing drug store services. The company operates through the following segments: Retail Pharmacy USA, Retail Pharmacy International, and Pharmaceutical Wholesale. Around 74% of sales come from the Retail Pharmacy USA business. The company generated sales of USD 118.2 billion in 2017. Net income amounted to USD 4.08 billion in the same period. 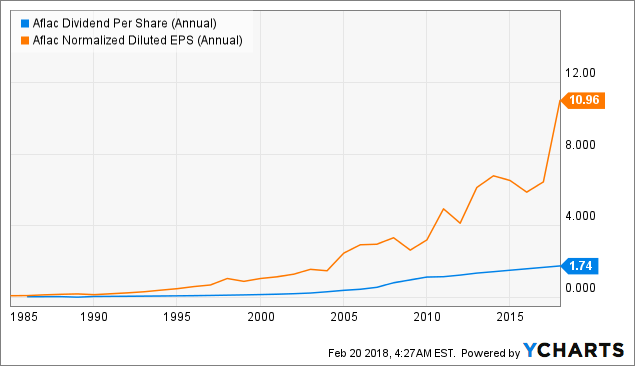 If you look at the data per share, you see a constant long-term rising in earnings, book value and dividends. WBA increased dividend payments over 41 consecutive years. The 10-year dividend grows at 16.2%. The latest dividend hike of just 6.6% is much lower than the past performance. There is pressure in the in the industry to consolidate. You see a lot of mergers in this space. For example, Walgreen tried to merge with Ride Aid and recently announced a step to acquire Boots Alliance. But it is not easy to grow in a very consolidated industry. Growth perspectives are great for Walgreens. Earnings are expected to rise to USD 5.78 this year and USD 6.04 in 2019. Walgreen is the dominant player in the drug retail industry, together with CVS Health (NYSE:CVS). The reason why the stock price doesn't reflect the good fundamental development could be the fear of a market entry from Amazon. The online giant often announced to enter the drug retail space but has not delivered a detailed concept for this. Eaton Vance through its subsidiaries, engages in the creation, marketing, and management of investment funds. It offers a range of engineered portfolio implementation services, including tax-managed core and specialty index strategies, futures and options-based portfolio overlays, and centralized portfolio management of multi-manager portfolios. In 2017, Eaton Vance generated sales of USD 1.53 billion. The net income was USD 282 million. Eaton Vance increased its dividend payments over 37 consecutive years. The average growth rate over the past 10-years was 8.5%. The latest dividend hike of 10.7% was above past values. 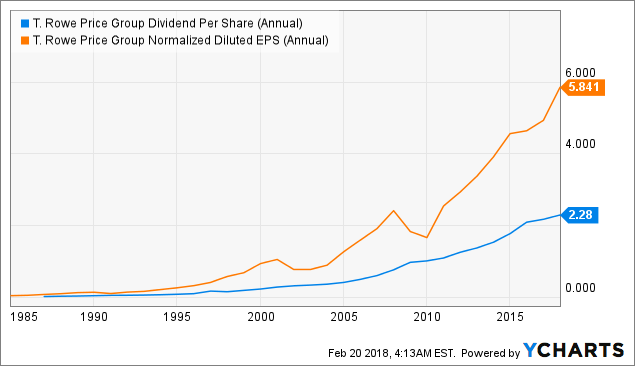 There is also room for further dividend hikes if you look at the gap between dividend payments and earnings. The industry perspectives are the same as for T. Rowe Price. I believe that TROW may be the better selection due to a better diversification and broader business. Eaton is also a smaller competitor with a market cap of just USD 6.6 billion compared to TROW's USD 26.8 billion. It is very important to be big in this industry. 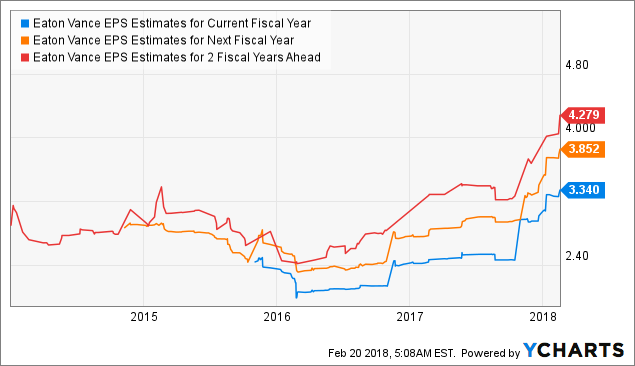 If you look at the earnings estimates for the next fiscal years, you have also a solid basis for further dividend growth. Nucor Corp. engages in the manufacturing of steel and steel products. It operates through the following segments: Steel Mills, Steel Products, and Raw Materials. Most of its revenues come from Steel Mills. In 2017, sales of USD 20.3 billion were generated. The net income stood at USD 1.3 billion. The steel industry is a hard business with massive price pressure and cycles. If you bet at the right time, you can earn much money but if you are wrong, you will get a big hit. The steel producer increased dividends over 45 consecutive years at 9.1% 10-year average growth rates. The latest dividend hike was a micro hike with 0.66%. This was more a step to remain a Dividend Champion than to give shareholders a significant part of the earnings. 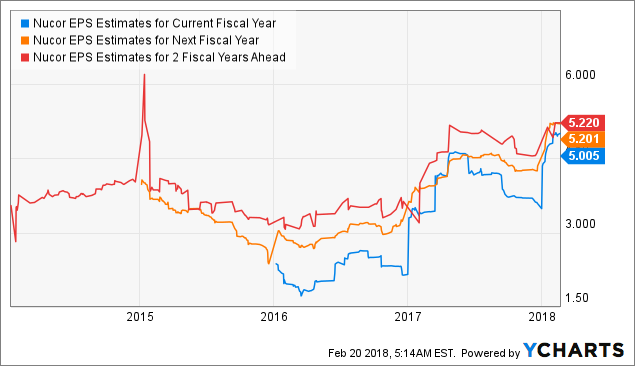 Nucor is a very cyclical stock. 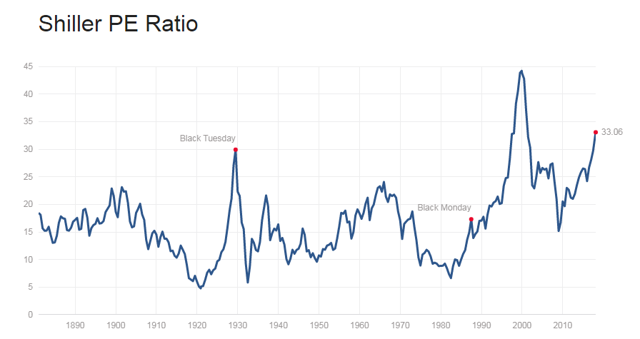 If you look at the earnings, you see how volatile the income ratio is. 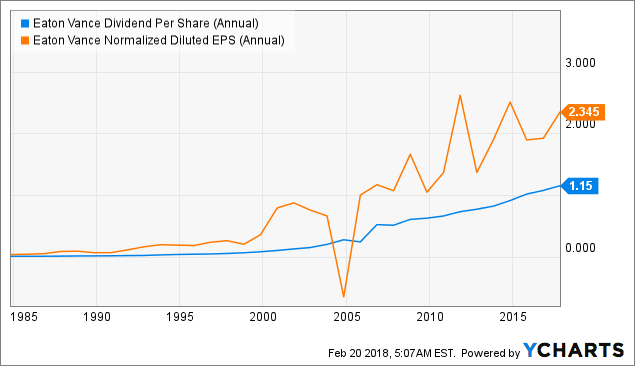 The dividend rate is nearly flat line that is crossed by earnings periodically. 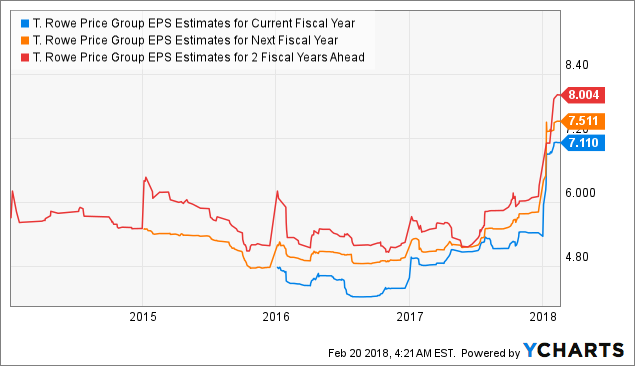 For the next years, the earnings estimates are looking good and they are high enough to pay the current dividend of USD 1.51 per share but you may not expect a high EPS growth for the next years. H.B. Fuller engages in the formulation, manufacture, and market of adhesives, sealants, and other specialty chemical products. It operates through the following segments: Americas Adhesives, EIMEA, Asia Pacific, Construction Products, and Engineering Adhesives. FUL generated sales of USD 2.3 billion in 2017 and a net income of just USD 58 million. If you look at the sales and product share contributions, you will find out that Fuller is well diversified in its operations. But H.B. Fuller operates a cyclical business and offering low margins. In 2017, they worked with a gross margin of 26.2%. H.B. Fuller increased dividends over 48 consecutive years. The 10-year dividend growth rate stood at 8.7%. Despite the cyclic business, FUL has done a great job to manage constant rising dividend payments. 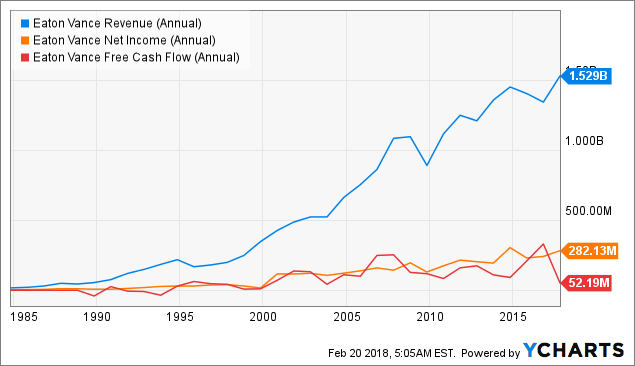 The latest dividend hike of 7.1% was nearly in line with the past long-term dividend growth rate. H.B. Fuller bought Royal Adhesives in 2017 and boosted its Q4 revenue by 18%. Despite the integration potential, analysts predict sales of USD 3 billion in 2018 and earnings of USD 158 million. For the current fiscal year, an EPS of USD 3.21 is estimated. Next year, the earnings prediction rises to nearly USD 4 per share. Compared to its current dividend payments of USD 60 Cents per share, there is enough room to grow its dividend. The high market valuations advise investors to stay away from stocks. In general, it is wise not to buy stocks for long-term considerations but if you buy at reasonable prices, you still can make money on the market. 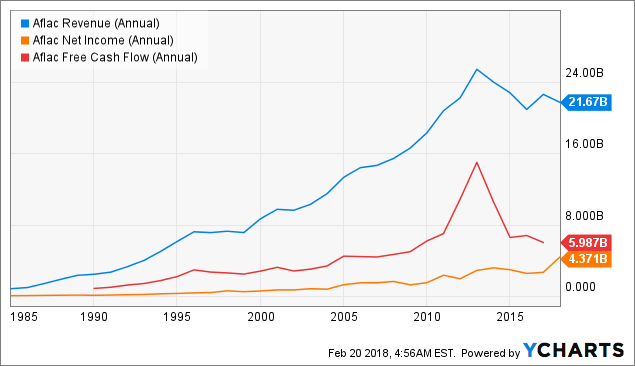 The article shows that some of the "cheaper stocks" with the longest dividend growth history have tough times but they increase dividends at the lowest rates in their history. Others do better, boosting their dividend payments and ramp up share buybacks. It's a question of the financial flexibility and strategy how much the management could give investors back. 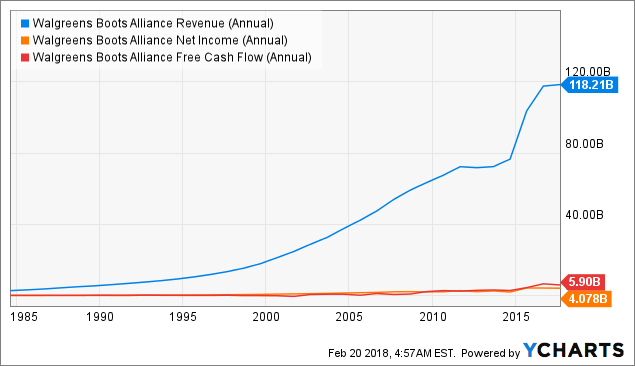 In this environment, I personally like T. Rowe Price and Aflac. Each of the stocks has a short-term backwind with rising interest rates. But you need to look at the yield curve to find the right exit point.